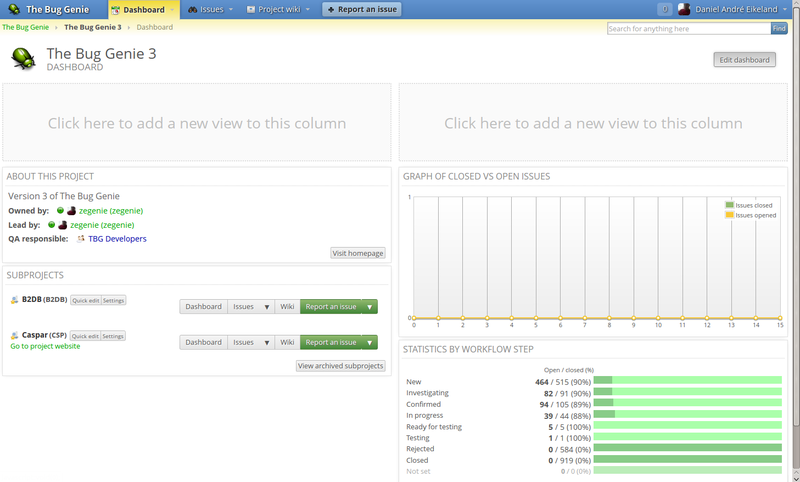 So, dashboards in The Bug Genie has always been a bit of a pain to set up. There wasn’t really any simple way to edit them, they resized awkwardly, and they just never looked “right”. Know what I mean? Disregarding the “metal” look and feel, which was kind of a theme in 3.2, there’s room for improvement. In 3.3, we’ve improved and streamlined dashboards, so they now give you a cleaner look, and an easier way to set up and configure. 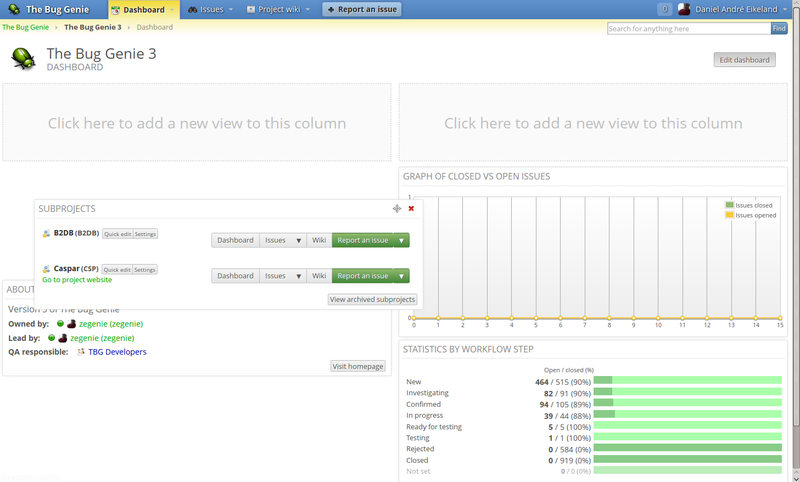 Above is a picture of a simple project dashboard in 3.3, set up using the new dashboard editor. 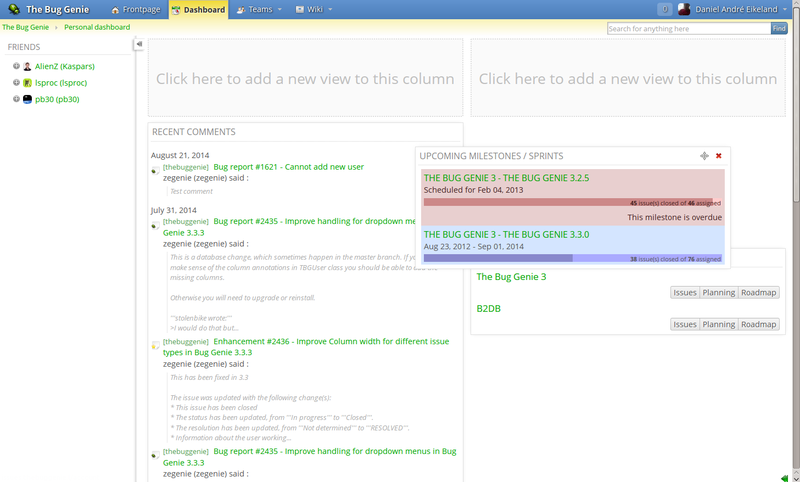 The new dashboard editor gives you a drag and drop interface to manage the dashboard, live updates of widgets as you add them, and an extensible backend to allow anyone to write new dashboard widgets for The Bug Genie. 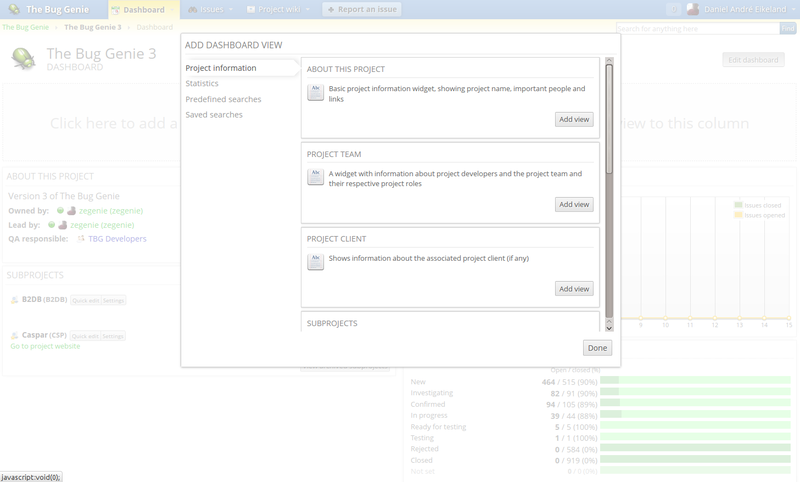 This new dashboard functionality replaces the old duplicated dashboard functionality from the user- and project dashboard, meaning you get the same features in your own user dashboard. 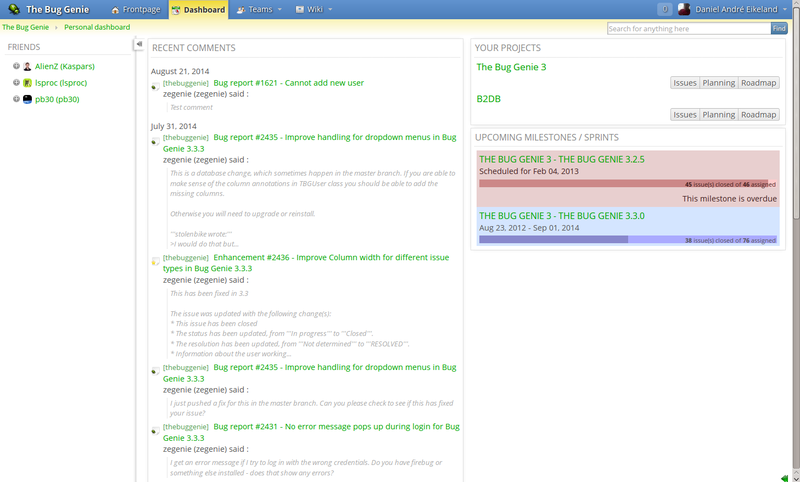 As an additional benefit, we’ve removed the persistent right sidebar from your dashboard and created “Your projects” and “Upcoming milestones” widgets instead, that you can add to your dashboard if you want to. 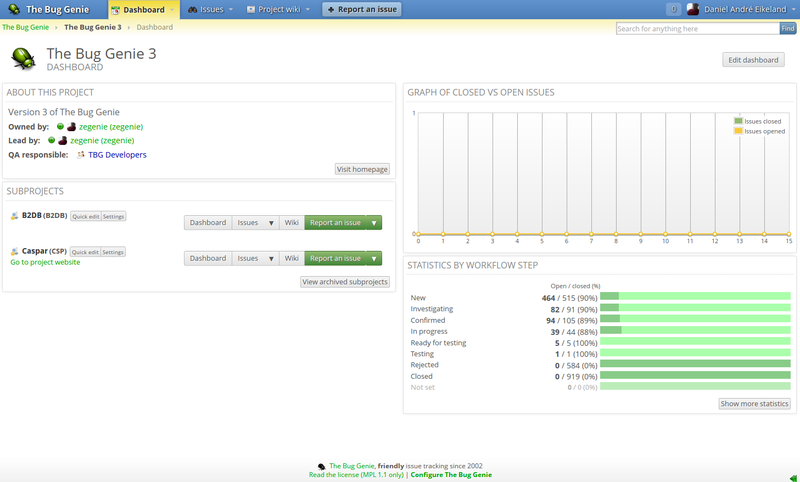 We hope you like the new dashboard functionality when it goes live. 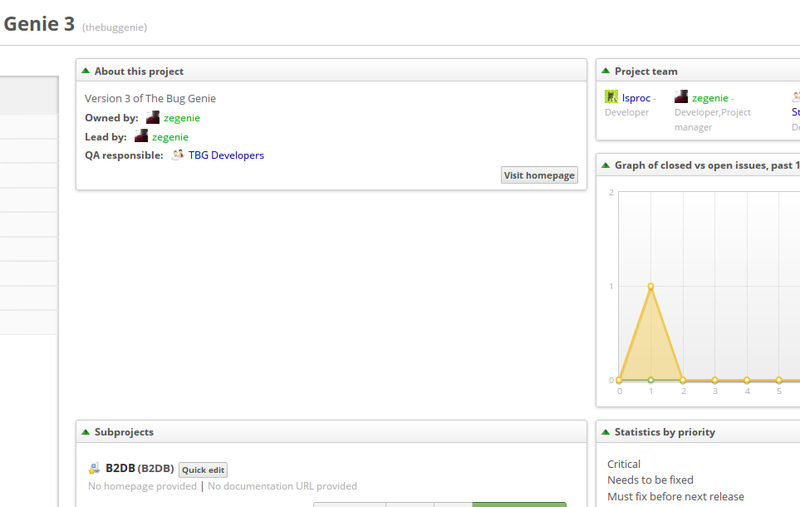 “So, what’s holding up the release, actually – and where did the project sidebar go?”, I hear you wonder silently. Well, aren’t you sharp-eyed! More about that in the next blog post! Thanks for the update, looking forward to getting my hands on it ! Will 3.3 be released or is the plan to skip it and go straight to 4?